The Wings For Wishes Committee celebrates the $200,000 raised to Benefit Make-A-Wish Southern Florida. 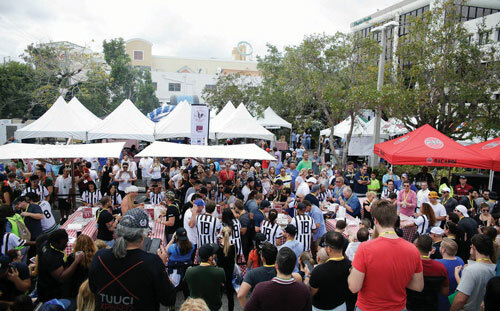 On Saturday, March 10th, the 4th Annual Wings For Wishes block party raised $200,000 to sponsor wishes through Make-A-Wish® Southern Florida. 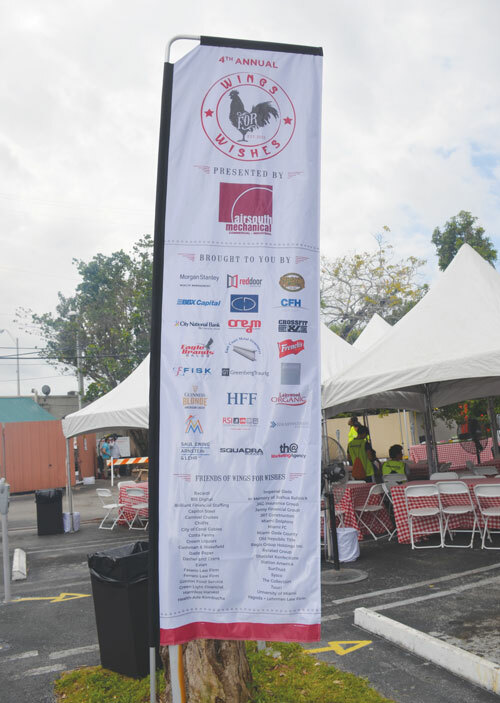 Wings For Wishes, presented by AirSouth Mechanical, and co-hosted by Make-A-Wish Champions and Sports Grill South Miami, was a family-friendly event centered on Sports Grill’s famous Special Grilled chicken wings and raising money to sponsor wishes. 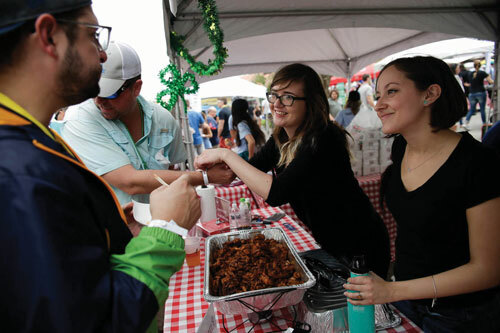 The event offered a ‘block party’ format with a savory wing tasting component, in addition to the crowd-favorite wing eating competition. Sports Grill featured six different tasting stations, allowing patrons to pair their food with a variety of craft beers, wine, and premium spirits provided by Bacardi. Fox Sports Florida’s Jessica Blaylock guided the event activities from the main stage as the Master of Ceremonies. 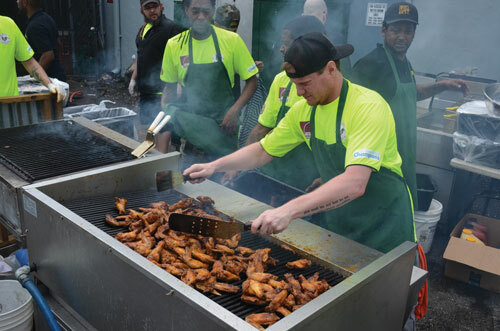 Sixty-three teams participated in Sports Grill’s Special Grilled Wing Eating Competition. 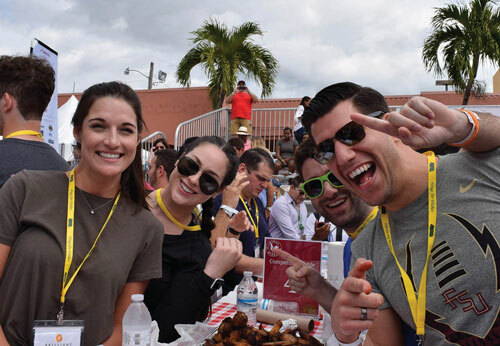 Local TV stations WTVJ-NBC 6, WPLG-ABC 10, and WSVN- FOX 7 fielded their own teams for a friendly wing-eating battle amongst colleagues. Evelyn Curry, local radio personality called the competition for the live audience. This year’s winner was Team Icarus, who ate more than 75 wings and won the final championship round in just under 1 minute and 6 seconds. The afternoon was filled with live music, a DJ, and plenty of fun games for kids and adults alike. This year’s event featured live music from notable local acts including Brendan O’Hara & Chad Bernstein, Brothers of Others, and Ripcord and Arrowhead from Young Musicians Unite, whose mission is to give underserved students a voice through music, by providing free in-school and after-school music education. Wings For Wishes is a third-party event founded by Make-A-Wish Champions Gal Bensaadon and Brian R. Exelbert, two Miami professionals committed to making life better for kids with critical illnesses. To date, Wings For Wishes has raised over $335,000, all going directly to granting wishes. These funds helped sponsor 67 wishes. Getting ready for the Wings For Wishes Wing Eating Competition. 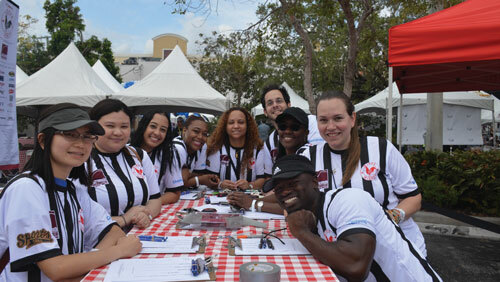 Volunteer “refs” prepare to judge the contest. A Wings For Wishes competitive team gets ready for the heat. 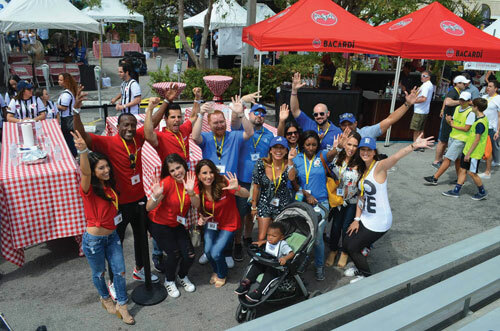 Local TV stations WTVJ-NBC 6, WPLG-ABC 10, and WSVN- FOX 7 gather teams for a friendly photo after their wing-eating battle amongst colleagues. Wings For Wishes Co-Founders Brian Exelbert and Gal Bensaadon with Christine Marques, Wings For Wishes Co-host and Managing Partner of Sports Grill Restaurants, share an official proclamation from the City of Coral Gables. 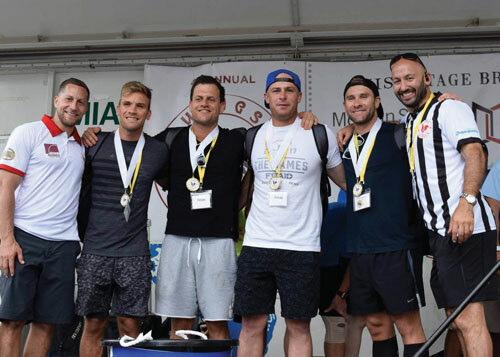 Wings For Wishes Co-Founder Brian Exelbert with Andrew Ferraro, David Perlman, Scott Gates, James Ferraro, of Team Icarus, the 4th Annual Wing Eating Competition Champions, and Gal Bensaadon, Wings For Wishes Co-Founder.